Holy Molly! 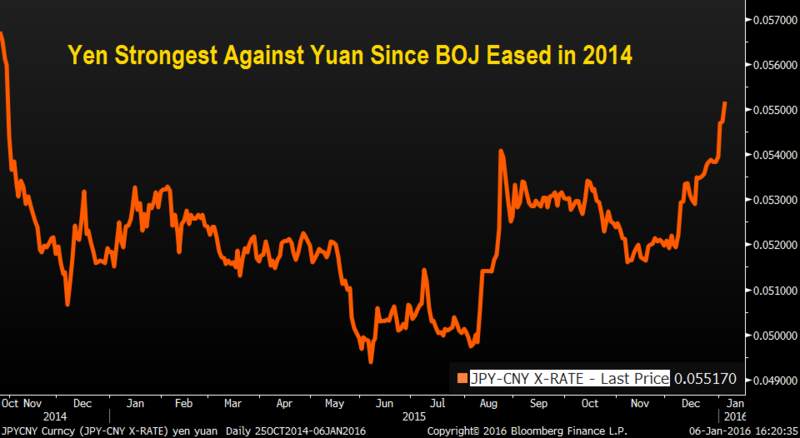 We all got an early New Year surprise from the biggest economy in the world-China. This prompted me to do a quick update on China. Lots of Monkey Business in the global economy this year. Buckle up!!! Stocks fell around the world and commodities slid after China’s central bank set the yuan’s reference rate at an unexpectedly weak level, a reminder of the shock depreciation in August that sparked a wave of financial-market turmoil. U.S. stocks dropped to a three-month low and emerging-market equities fell to the cheapest since 2009. Developing-nation currencies sank to a record as Korea’s won weakened after North Korea said it conducted a nuclear test, adding to geopolitical risks already heightened by tensions between Saudi Arabia and Iran. Brent crude reached its lowest level since 2004 on glut concerns. The yen reached its strongest level since October and Treasuries rose for a fifth session on demand for haven assets. China’s growing tolerance for a weaker yuan signaled the government is struggling in its efforts to shore up economic growth and stem a rout in its equities. The flight from risk assets Wednesday rekindled concern seen in August, when a shock devaluation sent U.S. stocks to their first correction in four years amid the slowdown would hamper global growth. Disinflation in Europe and a renewed selloff in commodities may make it harder for central banks to meet their policy goals. The MSCI All-Country World Index fell 1.3 percent at 9:34 a.m. in New York. The Standard & Poor’s 500 Index dropped 1.4 percent to the lowest level since Oct. 6. The Dow Jones Industrial Average fell 250 points. Sentiment has turned more cautious on stocks after the Federal Reserve’s first interest-rate increase since 2006 and forecasts for little to no growth in corporate earnings until March. A report Wednesday showed companies added more workers than projected in December, indicating the job market had momentum as 2015 came to a close. Gauges on services-industry growth and factory activity are also due today, as well as minutes from the Fed’s December rate-setting meeting. The Stoxx Europe 600 Index slid 1.7 percent. Commodity producers and carmakers — companies with some of the largest sales exposure to China — led declines. Tuesday’s rebound from the worst-ever start to the year was short-lived and the Stoxx 600 is down 3.4 percent this week. The VStoxx Index, which tracks the cost of options protecting against swings on the Euro Stoxx 50 Index, rose 5.3 percent to trade near a three-week high. 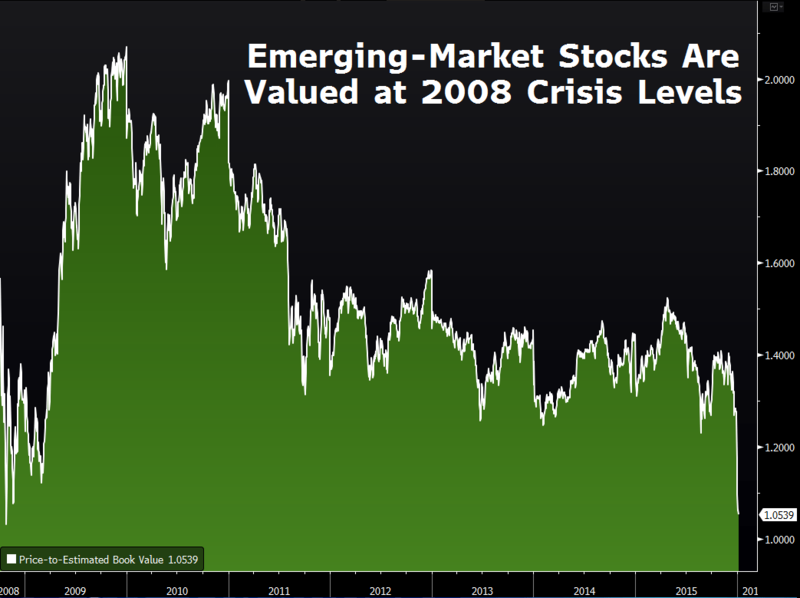 The MSCI Emerging Markets Index slid 1.1 percent to the lowest since July 2009, with all all but one of the 10 industry groups retreating. Technology companies led losses, tumbling to the lowest level since September. Benchmark gauges in Hong Kong, Taiwan and Saudi Arabia dropped at least 1 percent. The Hang Seng China Enterprises Index of mainland companies listed in Hong Kong fell 0.9 percent, while the Shanghai Composite Index jumped 2.3 percent amid efforts by authorities to support the market. Marc Faber, publisher of the Gloom, Boom & Doom Report said in an interview on Bloomberg TV the Chinese economy may be headed for a “hard landing” as borrowers are taking on record amounts of debt to repay interest on their existing obligations. The Bloomberg-JPMorgan Asia Dollar Indexfell to the lowest level since April 2009 as China’s central bank weakened the yuan’s reference rate for the seventh day in a row. The gap between the yuan rate inside China and that for the currency traded offshore expanded, underscoring speculation the government faces pressure to devalue its currency to aid the economy. 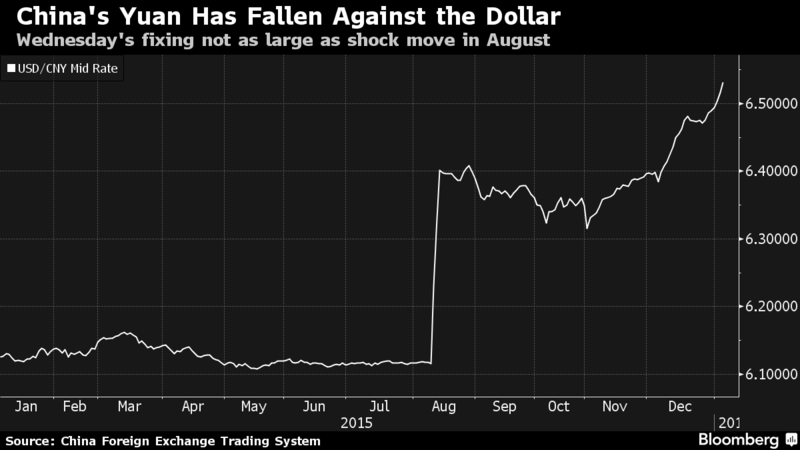 China’s yuan fell 0.6 percent in Hong Kong’s freely traded market. Malaysia’s ringgit, Russia’s ruble, Turkey’s lira and the South African rand slid at least 0.8 percent as the measure of 20 developing-nation currencies dropped 0.5 percent. South Korea’s won fell 0.8 percent to the weakest level since September while the equity benchmark slipped 0.3 percent. North Korea said it successfully tested a hydrogen bomb, a move that escalates tensions on the peninsula with neighbors South Korea and Japan. The yen appreciated 0.5 percent to 118.42 per U.S. dollar and reached 118.25, the strongest since Oct. 15. Japan’s currency surged more than 1 percent against the yuan to the highest level since October 2014, just before the Bank of Japan expanded monetary easing. The People’s Bank of China lowered its daily fixing by 0.22 percent to the weakest level since April 2011, raising the risk other nations will need to lower their exchange rates to remain competitive. Australia’s currency fell 1.2 percent and reached the lowest since November while the New Zealand dollar tumbled 0.9 percent. China is the largest export market for both South Pacific nations. Treasuries advanced with the yield on 10-year notes falling five basis points to 2.18 percent. Euro-region government bonds also gained, pushing the yield on 10-year German debt to 0.50 percent, the lowest in more than a month, as signs of slowing global growth and a further drop in oil boosted demand for fixed-income assets. Germany sold debt due in 2017 with an average yield of minus 0.38 percent, matching the lowest on record. The nation received enough bids to reach its sales goal. The securities were auctioned to yield minus 0.32 percent at a previous sale last month. The cost of insuring corporate debt rose to the highest in about two weeks. The Markit iTraxx Europe Index of credit-default swaps on investment-grade companies climbed one basis point to 82 basis points. The Markit iTraxx Europe Crossover Index of swaps on junk-rated companies jumped 10 basis points to 339 basis points. Oil slumped before weekly U.S. government data forecast to show stockpiles rose in the world’s biggest crude consumer. Brent crude for February settlement fell as much as $1.80 or 4.9 percent, to $34.62 a barrel on the London-based ICE Futures Europe exchange. West Texas Intermediate declined 3.3 percent after dropping 2.2 percent Tuesday. U.S. oil inventories probably increased by 500,000 barrels last week, according to a Bloomberg survey before Energy Information Administration data Wednesday. The industry-funded American Petroleum Institute was said to report stockpiles fell by 5.6 million barrels while fuel supplies gained. Gold for immediate delivery advanced 0.9 percent to $1,086.82 an ounce following two days of gains. Demand for the precious metal has been bolstered as gyrations in global stock markets enhance its allure as a haven investment. Zinc on the London Metal Exchange dropped 2.3 percent to the lowest since Dec. 29. Copper fell 1 percent. For more than two decades the Chinese Communist party has offered the masses an unwritten social contract — we will manage the country and allow you to get rich, as long as you stay out of politics. Rapidly rising living standards and a bureaucracy that was remarkably successful at achieving high rates of growth left most ordinary citizens convinced this was a pretty good deal. But a stock market crash and a series of policy mis-steps over the summer have left many investors questioning their faith in the infallibility of the mandarins in Beijing. Meanwhile, the relentless slowdown in the broader Chinese economy that has been under way for the last few years appears to be worsening, and deep-seated problems in the real estate, manufacturing and financial sectors are becoming more acute. As recently as two years ago, many Chinese officials were still confidently predicting that the economy would continue to expand at a steady rate of 8 per cent for at least two more decades. But China will grow at its slowest annual pace in a quarter of a century this year as the Communist Party struggles to achieve its full-year target of “around 7 per cent” growth in GDP. According to official statistics, the economy expanded 6.9 per cent in the third quarter from a year earlier, after growing by 7 per cent in the first half. Tao Wang, the chief China economist at UBS, predicts growth will slow to 6.2 per cent next year and 5.8 per cent in 2017. Investors are unlikely to see any relief from China’s enormous export sector, which is struggling with weak global demand, rising environmental and labour costs and a strengthening renminbi. At the start of 2015, the government set a target of 6 per cent expansion in total trade, but in the first 10 months of the year China’s trade with the rest of the world shrank 8 per cent from the same period a year earlier. Woes in the export sector were one reason for the Chinese government’s decision to devalue the renminbi on August 11, according to people familiar with the matter. But the shocked reaction of global markets and the abrupt volte-face that followed that decision probably did more to harm Chinese leaders’ reputation for economic competence than anything else. In fact, global investors had already been losing confidence in the Chinese authorities for some time. Around the middle of 2014 it became clear that the government had decided to encourage speculation in the country’s vast, but poorly regulated, equity market. By attaching its imprimatur to a bubble the government believed it could engineer a giant debt-for-equity swap as companies sold shares to pay off some of the crushing debt that was harder to service as growth slowed. As the benchmark Shanghai index soared in early 2015 the People’s Daily, the official mouthpiece of the Communist Party, crowed in a front page editorial that this was only the start of a multiyear bull market. But barely two months later the bubble burst and prices of equities, that had been driven upwards by a flood of newly sanctioned margin trading, started to plummet. Beijing’s knee jerk reaction was a massive state-sponsored rescue effort to buy stocks and stop the price falls. When that did not work the government banned large shareholders from selling any stocks. The market kept falling and eventually the “national team” of state-backed stock-buying funds abandoned their attempts to prop up prices — but not before they had spent more than $200bn trying to support the market. “This was a huge hit to the government’s credibility and it just got worse with the failed devaluation attempt,” said one market participant with close ties to top financial regulators. On August 11, the day the People’s Bank of China — China’s central bank — announced its devaluation, several of the PBOC’s most senior officials were on holiday and had to be recalled, according to several people with knowledge of the matter. These people said the PBOC had proposed the move as just one possible policy option and did not expect the central leadership to adopt it so promptly. At first glance the announcement appeared to be a master stroke. In addition to a small “one-off” devaluation of less than 1 per cent against the US dollar, the PBOC also said it would now allow the market to play a much bigger role in setting the exchange rate — a reform the IMF and many other institutions had been urging for years. That meant Beijing could devalue the currency to help struggling exporters while also appearing to be complying with IMF demands. Theoretically, this would not lead to competitive devaluations from other countries and China would not be accused of following a mercantilist policy. Over the next few days investors pushed the value of the renminbi down by close to 5 per cent, as Beijing had hoped. But outside China’s borders global markets and regional Asian currencies were collapsing as investors worried about a currency war amid fears the Chinese economy was in much worse trouble than anyone had thought. If this prediction is correct it will have a vast impact on global companies and investors operating in or coming to China. For years, the ever-rising value of the renminbi was as certain and stable as the Communist Party’s social contract with its citizens and that meant a one-way bet and an extra attraction for foreign investors pouring into renminbi assets. Investors looking for a bright spot in China have pointed to resilience in consumption and service sectors, which have held up even as growth in investment, construction, manufacturing and heavy industries has plummeted. The government has encouraged this optimism by pledging to shift the Chinese growth model from investment and construction to consumption and services. But in unpublished recent remarks to visiting foreign dignitaries, even China’s outspoken finance minister, Lou Jiwei, forecast four or five years of much lower growth as the economy digests massive industrial overcapacity, as well as excessive debt levels that are still rising. He also warned that he expects “labour pains” as unemployment rises. As growth slows and debt piles up the government’s unwritten contract with the masses — and with global investors — is looking increasingly strained. These comments come from various sources…. A key aspect of China’s financial reform in 2015 is the development of the domestic bond market. While China’s bond market is the third largest in the world, behind US and Japan, its share of GDP (around 70%)remains small when comparing to many other countries (e.g. 200% in Japan and 224% in US). China’s bond market is also mostly domestic, with very few foreign players both as issuers and as investors. Chinese policymakers have increasingly recognized the importance of developing the local currency bond market as a source of financing for enterprises and as an asset class for both domestic and foreign investors. As part of China’s efforts to open up the capital account and internationalize the RMB, there have been some important measures in 2015 to open up the bond market for issuers and investors. China’s bond market has RMB 45 trillion (USD 7 trillion) outstanding as of October 2015, which is an increase of 25% from the 2014 volume and six-fold from a decade-ago, although about RMB 3 trillion is a result of the local government debt swap program implemented this year. The market is also very liquid – the trading volume, at RMB 548 trillion (USD 86 trillion) as of October 2015, represents an increase of 41% from end of 2014. Most bonds, around 93%, are traded on the interbank market (CIBM)which is regulated by the People’s Bank of China (PBOC) while the remaining bonds are traded on the Shanghai and Shenzhen stock exchanges, which are regulated by the China Securities Regulatory Commission (CSRC). About 30% of the outstanding bonds are treasury bonds, direct local government issuance and central bank bills. The remaining 70% of the market is dominated by financial bonds (issued by policy banks, commercial banks and other Chinese financial institutions), and corporate bonds (issued by non-financial companies, many of them SOEs). The rapid growth of China’s bond market is expected to continue over the next several years. Commentators from PBOC/NAFMII (China’s self-regulatory entity for CIBM) and private sectors have all recently said that the current growth rate of 20%+ is expected to continue for the next five years, and a common assessment is that the market will reach RMB 100 trillion by 2020, overtaking Japan to become world’s second largest. is replaced with a simplified filing process. In addition, the range of transactions for these investors has been expanded to include repo, lending, forwards and derivatives and there will be no requirement for minimum investment period or minimum investment amount. The choice of trading and clearing agents is also expanded from just the PBOC to dozens of Chinese and foreign financial institutions. The new and improved PBOC CIBM program is considered by many as a major milestone to relax restrictions for foreign investors in China’s bond market. However, it seems that the July announcement has so far not resulted in significant increase in investment allocation from foreign central banks/IFIs/SWGs as many are still adjusting to the new program requirements and assessing new investment options – the pace of foreign investment growth may pick up in 2016 and beyond with RMB now in the SDR basket and increasingly considered an international currency. China’s bond market has also been mostly closed to foreign issuers until this year when the Panda bond market experienced major developments. A Panda bond is a RMB-denominated bond from a foreign issuer in China’s onshore market. IFC and ADB were the first ones to issue Panda bonds in 2005 but restrictions on the repatriation of proceeds outside of China have left this market dormant until recently. Following this summer’s market turmoil in China, interests from both issuers and investors in the offshore dim sum bond market have been drying up. According to Reuters, dim sum issuance in 2014 reached RMB 337.8 billion ($53 billion), but the total year to date stands at just RMB 150.8 billion. Province of British Columbia became the first sovereign issuer to register its Panda bond program with NAFMII and has plan to issue up to RMB 6 billion. Other foreign issuers have also expressed interest in issuing Panda bonds next year, including DBS and IFC. While it has not been publicly announced, it is foreseeable that the new AIIB (Asian Infrastructure Investment Bank) and NDB (New Development Bank by the BRICS bloc) could also become Panda bond issuers as they become operational. While the Panda bond market will not completely replace the dim sum bond market, it is expected to grow rapidly, with IFC expecting the market to reach USD 50 billion in the next five years. Investors’ demand for high-quality Panda bond issuance is expected to be strong – it is reported that Korea’s issuance was five-times subscribed. Despite the excitement, there are some outstanding issues for China to resolve to develop a mature Panda bond market.  Repatriation of funds: It is not clear the standard policy on whether foreign issuers are free to repatriate funds from the bond issuance. While this may be less of an issue for some issuers (such as sovereign and Chinese FIs) and regulators seem to be willing to discuss on a case-by-case basis, a clear policy may be needed if the number of issuers increase significantly.  Accounting recognition: Issuers of Panda bonds would need to follow China’s accounting standards, or standards that China recognizes, such as IFRS. US and Japanese companies following US GAAP and Japan GAAP may face the challenge of meeting different accounting standards, given that China does not yet have mutual recognition agreement of accounting standards with their governments.  Credit rating agencies (CRAs): China’s bond market has been mostly closed to foreign CRAs and the bonds are rated by domestic CRAs, which have a reputation to inflate ratings. Many Chinese bonds are AAA rated domestically. However, as more foreign issuers start to enter the market, differentiation of credit quality will become important. Korea, which is rated AA- by S&P, got a AAA credit rating from a Chinese CRA for its Panda bond. To grow the Panda bond market, Chinese regulators may need to consider more clear policies and standards on the use of CRAs. With the bond market’s opening up to foreign investors and foreign issuers, there is an increased degree of urgency to address some of the issues that are unique to China’s bond market, in particular, CRAs and default settlement process. CRAs: as mentioned earlier, foreign CRAs such as S&P, Moody’s and Fitch are largely kept out of China’s bond market and bonds are rated by domestic CRAs. There are four large Chinese CRAs, China Chengxin International Credit Rating (a JV with Moody’s), China Lianhe Credit Rating (a JV with Fitch), Dagong Global Credit Rating and Shanghai Far East Credit Rating. A large number of domestic issuers are rated AAA or AA by domestic CRAs, several notches above China’s international sovereign rating of A+ (Fitch) and AA- (S&P). Most large Chinese investment firms do not trust CRAs’ credit ratings and reply on extensive internal risk assessment. Several investment professionals have acknowledged that ratings by Chinese CRAs are inflated by around 2 to 5 notches. As China’s bond market develops and becomes more internationalized, a reliable credit rating system that meets international standards would be needed.  Default settlement: There had been no bond default in China before 2014 as government at various levels and state-owned entities would always bailout any issuers facing financial difficulties. The culture of automatic bailout has created serious moral hazard problems. In recent months, there has been evidence that policymakers are more willing to tolerate some defaults. Since the first default of Chaori’s debt in March 2014, there have been about 30 default events, including some SOEs. Notables ones include Sinosteel, Er Zhong and the latest, China Shanshui Cement. While government eventually intervened in a few cases (e.g. Sinosteel), some were allowed to go through the default settlement process. The government’s current policy seems to be “selective bailout”, in an effort to strike a balance between reform/reduced moral hazard and market stability. As economy slows and policymakers intensify efforts to reduce industrial over-capacity over the next several years, more frequent default events are expected, which underscores the need for a more transparent default settlement and investor protection regime. As bond defaults are relatively new, the legal system, regulators and market practitioners are still learning to figure out standards and best practices. With RMB becoming increasingly internationalized and capital market continues to open up, China’s bond market will continue to grow rapidly, both in size and in product diversity. However, economic headwinds and government’s policy direction to move away from automatic bailout mean credit risks are rising, particularly for companies in the over-capacity industries such as steel, coal, cement and shipbuilding. Many Chinese enterprises are already facing high leverage and lower profits, and there are no improvements in sights. Facing such challenging environment, policymakers’ actions and new reform measures going forward would be critical to ensure the healthy development of China’s bond market into a more mature market that converges to international standards. With all this chaos in China, it is important hang in there and remember the Fundamentals of Doing Business in China. Financial Times did this great special report video. Hope you enjoy .